All classes are in Usui Reiki Ryoho. Most classes available in classroom settings, privately, or at a distance via Skype. Contact Karen for private classes or Skype sessions. Karen is a Usui Ryoho Reiki Master/Teacher who provides private instruction and public classes and attunements for this modality. Private classes can be scheduled in person or via Skype. Contact Karen for to schedule your class. 4 to 5 hours, no pre-requisites. 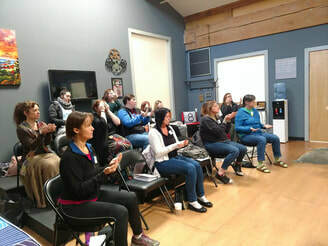 ​Next class: There is a class scheduled for 5/19/19 from 12:30 to 4:30 PM at the Firstenburg Community Center in Vancouver, WA. Sign up here. Private classes can be scheduled in person or via Skype. Contact Karen for to schedule your class. 5 hours. Pre-requisite: First Degree Reiki practitioner and attunement, Second Degree practitioner and attunement. The class includes a First and Second Degree Reiki attunement. Want to incorporate healing crystals into your Reiki sessions? I can help you by teaching Crystal Reiki and offering a Crystal Reiki attunement. Pre-requisite is First and Second Degree Reiki. Take your Reiki practices to the next level using advanced energy healing techniques in conjunction with channeling Reiki energy. By combining modalities, you can strengthen Reiki energy and treat the whole person. Consultative healing partner intake that allows you to create a joint intention for the session and work with that intention throughout the session. Coaching your healing partner to use intention, affirmation, visualization, and self-healing techniques between sessions. Using touch techniques (tapping, stroking, and touch) to focus on specific energetic and physical issues. Strengthening, focusing, and directing Reiki energy using Quantum Touch® techniques. Using sound healing, vocalization, and sacred sound instruments to work with your Reiki practice. Chakra clearing and balancing techniques. Using crystals in your Reiki practice. Working with sacred geometry in your Reiki practice. Working with aroma and color in your Reiki practice. Creating your sacred Reiki space using energy techniques and feng shui principles. Recommended equipment for class: Karen will have some equipment available for practice (crystals, tingshas, aromatherapy, Tibetan singing bowls, Tibetan ghanta and dorje, but if you have your own or wish to purchase your own, Karen highly recommends you do, suggesting you find the highest quality you can afford. 1 set harmoniously tuned Tibetan tingshas ($10 to $60). Karen recommends these. 1 Tibetan ghanta (bell) and dorje set, any tuning ($30 to $60). Karen recommends these. 1 Tibetan singing bowl made from bell metal bronze or seven sacred metals (not brass or crystal) (price varies widely). Karen recommends a master quality bowl from Bodhisattva. Learn how to bring your own intuition into your Reiki practice using one of the pillars of Reiki, chiryo. This class provides practical tips for using your intuition and plenty of practice to allow intuition to flow and adapt your Reiki sessions to the intuitive information you receive. You'll also learn how to strengthen your intuition and how to conduct a fully intuitive session. This is a great way for Reiki practitioners of any degree to take their practice deeper. Pre-requisite: You must be attuned to First, Second, or Master-Teacher Degree Reiki. In this class, Karen helps you understand laws regarding Reiki in your state, discusses healing partner consultation and intake, helps you learn how to appropriately document, and provides information about other business best practices such as liability insurance, marketing, and HIPAA. Pre-requisite: First Degree Reiki certification and attunement. Learn how to coach your healing partners through goal setting, visualization and affirmation, and other practical aspects in conjunction with Reiki. Pre-requisite: First and Second Degree Reiki certification and attunement. Learn to use Reiki to empower your intention and to use Reiki in sessions to empower your healing partner's intention, as well. Learn specific hand positions and techniques that Dr. Mikao Usui taught his students to treat specific conditions. These are different than Western hand positions and techniques provided by Madam Takata, and you can use them to deepen your practice. This class is for Reiki practitioners of all degrees, although you must be at least a First Degree Reiki practitioner to participate. Reiki sprung from Dr. Mikao Usui's roots as a Buddhist, and many of the Buddhist roots of Reiki are not practiced in the West. Use Buddhist traditions and Western traditions to deepen your personal practice as a Reiki practitioner not only for personal enrichment, but so you can enhance the treatment you provide to your healing partners. This is for all levels of Reiki practitioners, although you must be attuned to at least First Degree Reiki to take the class. This class moves beyond the Reiki Master-Teacher training and attunement, helping you to develop your curriculum, write your Reiki manual, and offering specific techniques for teaching Reiki classes. You must be a Reiki Master-Teacher to take this class. For new Reiki Master-Teachers who want to delve more deeply into the practice of teaching, learn from Karen as she teaches her Reiki classes, gaining hands-on experience in curriculum, teaching, manual development, and attunement.